This series is over tonight. Stay away from the spread and take the over. Breezy? The winds are suppose to be between 20-25 all game. That a little more than breezy. The last time these two teams met was in Cincinnati and the Browns only gave up 80 rushing yards. Cincinnati was lucky to walk away with the W. This is a revenge game and the Browns cover and the total goes over. This will be tight. While I agree the under looks good. The problem becomes the running games. The Browns have been notorious for allowing big rushing yards and now that the Browns have their own running back this good be a ground battle that could yield a lot of points. The wind could also cause some INT's that could result in TD's. I stay clear of the Total, but I will take the Browns at home today. Best of Luck with the Total! 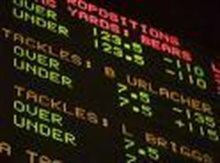 The smart money is betting the Browns. Browns win this one straight up! Who cares who wins? OVER 43! I know this is a betting site. But I have a important question and need some advice. In Fantasy football in a league where you start one running back (PPR) would you start Arian Foster tonight against Philly or Chris Johnson vs Jax. Just check Peyton Hillis' stats against the Jaguars and then make your descision. Hillis as you know has been putting up monster numbers but in this game only rushed for 48 yards. He did, however, have 95 yards and a TD receiving. Well, I use to post often on here and try and keep track of my plays. However, I've not posted very often this football season and I see that I haven't missed much. Guys are still on here bashing and calling names. I think the basis for this site is to share insight and input and win as much money as possible. So what if a guy posts in BOLD and brags aboout how great his picks are. Who cares, really? Let's concentrate on the games and winning money. I wish everyone the best of luck. Not that anyone cares, but I am taking Philly -9. I expect Vick and the Eagles to come out and put up a lot of points tonight and win by double digits. With your score shouldn't you be playing the ML? Not too confident, eh? Why is Cincinnati favored here? This is a backyard rivalry and Cinci has won the last 2 years. I look for Louisville to win this game at home tonight as Friday night Home Dogs! IMO it's best to do your own research and bet the way you want, it is of course, your money. I don't know a lot of you guys insist on bashing a guy when he loses, but I understand some guys brag too much and that's only asking for trouble. Anyhow, good luck this weekend and the rest of the season. oh yeah.. n Kansas has 5 extra days of rest.. These are 18-20 kids, ask any sharp and they will tell you rest isn't a big impact at this level. Jayhwaks lost to North Dakota State at home this year....hahaha. Not sure there is anything else to say about who I'm taking tonight. I think OSU is not all they are cracked up to be and Vegas knows it and are going to break a lot of Buckeye backers with this line. What do you know about Vegas and lines? This line opened up at 6 at most places and has dropped to 3.5 - 4. Now, you tell me, where the money is being spent? The Wisconsin backers have moved this line and the sharps probably got on this right when it opened at 6. If you're a Wisconsin backer you're too late, you should have jumped on this when it was between 4.5 and 6. Now, if you want to take the Buckeyes you can either wait till its get to 3 or but it down a half point. IMO the Badgers have not even come close to playing a DEF like Ohio State. It would surprise me if Wisconsin puts up more than 17 points. Now, I ask myself, can the Badgers hold the Buckeyes to 16 or less? Not a chance. Bucks win this game 27-17. Small play on the UNDER as well. Marshall bounces back pretty well as a home dog off a straight up and against the spread loss. I'll go with the trend and take the 13.5.... Maybe a new coach is just what the Herd needs to win the Battle of the Mountain State. I'll be happy with a cover. Tell me where you're getting 13.5?? Black, White, Green, Blue, Orange....the color doesn't matter...both QBs blow. Pryor has been hyped to death for years and now Harris has inexplicably become some kind of media favorite despite throwing 17 picks last year....I can see the Buckeye D making Jacory look really bad this week while Tressel protects Pryor enough (again) and avoids the mistakes in a comfortable home win. Protect him like he did in the Rose Bowl when he threw 23/37 for 266, 2 TDs and a INT? or last week when he went 17/25 for 247 with 3 TD's against Marshall. I think the Buckeyes throw more than you think.